BREAKING NEWS! Arnett Out - Kilmer In! Knight Rider Online has gotten the exclusive on the new voice of KITT. In what will come as a surprise to many, Will Arnett is no longer the voice of KITT in the new Knight Rider movie. We had heard about this about a month ago, but didn't want to break anything about it until we heard solid of a replacement. According to what we have heard, Will Arnett has an established career in voice over work, in particular with GMC Trucks. This would be a conflict for him, as Ford is the primary sponsor of the new Knight Rider movie, and he had to drop out. So this sent the crew of Knight Rider searching for a replacement. And that came yesterday with Val Kilmer. Val Kilmer, star of such films as Top Gun, The Doors, Batman Forever, Heat, Kiss Kiss Bang Bang, will be stepping in to voice the Knight Industries Three Thousand. He met with the producers last night, tried it out, and everyone was pleased. I mentioned last week there would be an announcement, well here it is, and only on KRO. Will Arnett has had to back out of voicing KITT because of a contractual conflict. This happened a few weeks ago. I was asked not to release this information until they figured out what they were going to do. Finally, as of last night, contracts with the replacement have been signed. 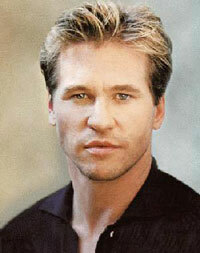 The new voice of KITT will be...Val Kilmer. He's a bona-fide movie star who has not done a lot of television, a very smart guy with and great voice and a lot of range, and the producers are very happy with the choice. They start today to re-voice the movie. While we are a fan of Will Arnetts, and very sad to hear that he had a conflict, we are very excited to have someone with such caliber as Val Kilmer on board, and look forward to hearing him as KITT very soon. Yeah I was mad that the show didn't make it. Hopefully it can make it back in some capacity. Confused. Was it Kilmer in the pilot, or Arnett? It didn't sound like Val when I wathced it back in February. Whoever it was sounded more like KARR. Also lets not forget that in the beginning the knight 2000 was just as rigid as the knight 3000 in term of personalities it wasn't until after spending time with Micheal knight that he developed into the KITT that we grew to love. so if they make a new series the we'll see some character development with the knight 3000. Besides, New car, New KITT, we may as well get a new voice since this is the next generation continuation of Knight Rider. But don't get me wrong. I have all respect in the world for William Daniels who played the voice of the old KITT and we all loved him for that, but for over 80 years old, I mean come on. That guy is way too old to sound the same as he did and continue on as KITT. Val Kilmer is a lot younger, more up to date and perfectly played the new KITT's voice flawlessly and solidly and it was just right. And besides, since the Knight Industries 3000 is another character of KITT, compared to Knight Industries 2000, it makes even more sense to have a different character voice. And as they've mention on some parts of the movie, Knight Industries 3000 is ANOTHER KITT. NOT THE SAME ONE AS 2000. So you may as well get a different character voice. Seriously, this is a new crew of characters for this new show and a new generation, so I say let them be different and also let them build their own new legendary character status. I mean COME ON people. This isn't really the 1980's anymore. That's all done and over with. Give me a break Michael Long. The sales of the Trans Am stopped in 2002. It'll Probably be 2010 before we see another Trans Am. IF WE SEE ONE BY THEN. If they're going to make a SHOW that's more up to date, it only makes sense that they have a CAR that's more up to date. And besides, The Shelby-Cobra KR Mustang is a lot more powerful than that of the Trans Am anyways. HELLO....That Mustang is a COBRA Edition. If you compare the Mustang Cobra's power to the Firebird Trans Am through edmunds.com, it'll tell you that the Shelby-Cobra KR Mustang has a lot more horsepower than the Tran's Am. Mr Daniels would have been my first choice for the voice of KITT. However, for some reason, that didn't happen, and I believe Val Kilmer is a fine replacement and he will do an incredible job for the voice of the new KITT. knight rider was my favourite tv show when i was a boy.I loved Kitt,loved KARR more but there's always something about the bad guys (ok it's a car) that makes us like them more.I loved to watch the new movie.I think that this one inovates as much as the previous one to say the least and i don't have problems with the car being a mustang.I think that not making it an upgrade was smart and since its a new car you could use any car you wanted,and mustang reflects todays taste for more aggressive and muscled look of cars.The trans am will be in the hearts and minds of the fans as the knight industries two thousand.Now its time for the mustang and the Knight industries three thousand.And by the looks of it the project may evolve into a new sucessfull knight rider.I liked Val kilmers voice,and praise the production for not using daniels because daniels is and will always be KITT,the first one.He had his own personality.The new KITT is kind of a diferent person (ok again its a car),using the same voice would strip both cars of their distint personalities and making the idea that even thouth separated by time they were justs bits and pieces put up together in some assembley line.KITT and KARR were built as equals and back then they didn't have the same voice,why would a new car made 25 years after have the same voice than the previous?get what i'm saying. Has for conections to the previous show they did enough to get started,this movie was to introduce the new kitt not about the old one.I think that the conections will be established and developed as the series progresses.People will want to know were's KITT (older model),why michael had to leave is family,and i don't know about you but i do remember KARR's CPU not being destroyed,what happened to it.But i must say that having the new KITT fighting alongside the older one doesn't excite me that much,the old one would be outdated and unprepared to face a new type of technological criminal compared to the new version it would somewhat leave fans a little sad to see its childhood hero being surpassed by a new one.So even though i want the old kitt back i wouldn't want it on a regular basis to be second hand sideckick to the new and more powerfull KITT.And we can't count out the days we live in.In the ages of the internet and multiple technological advancements every day,whe can't rule out the possibility that new cars like kitt or karr can be made.In the 80's KITT and KARR could be a dream and two of a kind,but i bet you that the new KITT may end up fighting other simillar projects that don't necessary have to be conected with him or his birth.Because in the world we live in today techonology doesn't belong to this government or that one.It belongs to everyone who can pay for it.you see that in the movie where the bad guys hack KITT and they have to shut it down.It means the tecknology can be accessed by more than just the FBI or the foundation for law and governement. I definitely think that Michael Knight should take the position the Devon Miles had as the head of FLAG - even the occassional appearance would be cool. I'm also not thrilled with the new voice of KITT - it does sound to much like KARR and not much personality behind it (sorry Val). William Daniels still would have been good - even at 80, they would just using his voice - Maybe Mike can do some work on the car to alter its personality and they can switch. I would also like to see an episode where there is some back story... why did Michael finally leave, where has he been and why did he leave his son, why was KITT (two thousand) disassembled and left in pieces on the floor, where is Bonnie? I need CLOSURE! that the Hoff saying I am your father and then leaving was cheesy (made me think of Darth Vader). The Hoff needs to run the Foundation, after all he has 25 years of experience. The original Kitt should be in the show even if he is a museum piece that gets dusted off from time to time to help out on missions. William Daniels is over 80 years old. If they want to take the show forward, from the movie, they risk losing KITTs new voice to a health issue or death of William. I would have liked to have had him back, but it was not reasonable based on the items above. I would have liked them to say what happened to KITT in the movie, but if their is a series I am sure they will address it. Also, when talking about KITT, they never mentioned KARR. I would have assumed that they would have been created by the same person and they made it sound like KITT was the first and only. Lastly, If you were going to bring Hoff into this, which they did then just have him driving KITT and be done with it. We didn't need the whole my son is driving now. Or, make Hoff the the new head of the foundation. Just some musings from a fan. I did like the TV movie though. Captain Garth, the original voice of Optimus Prime and the new movie is done by Peter Cullen. He was also the voice of KARR in the TV series. I like the new voice he sounds like Karr but only not evil. Anyone else feel slightly ill that the 'evolution' of the Knight Industries Two Thousand is a MUSTANG? Are none of you sick to your stomach? I mean, come on, from a Trans Am to this? The original series and that car went hand in hand, like Jack and Coke. What's next, is KARR gonna be a Kia Sportage? If it HAS to be something newer, why not a cherry late model Trans Am? Good news, actually; In all the promos Arnett sounded too much like KARR, which I found disturbing. Kilmer is solid actor and his voice is much, MUCH close to Mr. Daniels and the original KITT. Actually, I prefer Kilmer OVER Daniels, since, the new KITT isn't "Knight Industries Two Thousand", but the evolution of it, the next generation, if you will. It can't sound exactly the same, right? I'm a huge fan of Daniels. His voice matched KITT's personality so incredibly well in the original, and I am still disappointed that he is not involved in this project. Even if Daniels declined the offer, I'd still like to hear that they at least tried to get him back as KITT. They need to stay true to the original. as much as I would like Will Daniels to come back we don't even know if he WANTS to come back. Lets face it, the guy isn't exactly young and he might be retired. Well without being directly involved in the day to days of the production - we can't even begin to know if they did or did not reach out to Mr. Daniels. For all we know they did at some point, and he declined. with some of the bad feedback they been getting from loyal knight rider fans, dont you think it have been a good idea to at least bring William Daniels back just to keep a bit of old knight rider in there to make loyal fans wanting to watch and to keep them happy?